I have to admit that battery isolators are not my favorite product. They are used to take the charge from a single charge source such as an alternator and distribute it to two or more battery banks. There are other ways to do this which in my opinion are more successful. On high performance systems I like to use the Balmar Duo Charge to give just a measured dose of charge to a start battery. On other projects I find an automatic battery combiner (ACR) is the easiest way to go. However Isolators do have their place and if you are upgrading an existing system that already has an isolator, for example by putting in a bigger alternator, it is often easier to just upgrade the isolator than it is to change all the output wiring. So by all means use an isolator in this case. 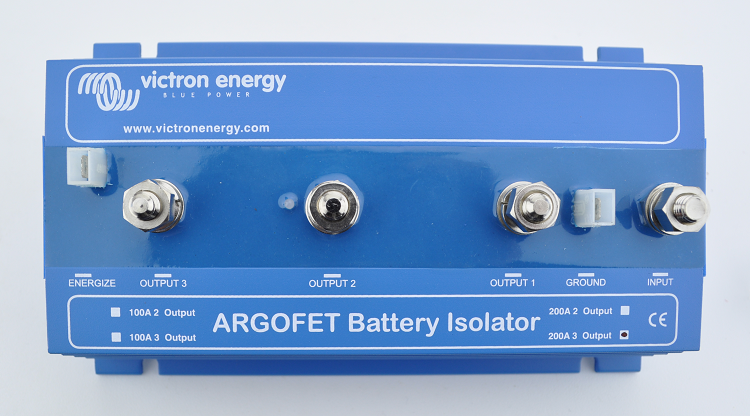 FET diodes like the Argofet have the least loss, next come isolators with Schottky diodes, and finally conventional diode isolators. Now, like all Victron products except batteries, these isolators come with a manufacturers five year warranty, so what's not to like about that?